"The Power of Faith has 'framed the world' and the Power of Faith to alter a way of life for a nation, a state, or an individual continues to be 'the Spark that God begot', the Spark of Cosmic Confidence that knows no bounds to possibility wedded to effort. Miracles are called for by mankind, yet the sense of the miraculous is often absent from their consciousness. The confining stakes that stretch forth the extent of the human claim are often a far cry from the mighty revelation of possibility which springs from the mind of God as the strength to accomplish, by the Power of Vision in action, born of Hope and nurtured by Charity. "We aspire today, as Cosmic Beings, (referencing here Faith, Hope, and Charity) to symbolize in action the mighty Threefold Flame: Love, Wisdom, and Power — Love as Charity, Wisdom as a Fount of Hope, and Faith as the Power to create and sustain an endeavor. Again and again we hear the mankind of Earth utter the words of limitation, the words that circumscribe them to an appointed round of normalcy. I ask you, now, in the Name of Divine Reason, what is really normal, save that which is referenced in a framework of relativity? "Does not your own history show forth numerous changes in the acceptability of scientific facts? Does not every era reflect significant changes as earmarks of progress upon the scale of mankind's advancement? Even the humanities reflect a supposed rate of progress. Yet, there are remnants of the past — relics of human discord and achievement, symbols of age-old frustrations — which exist side by side with the invisible, invincible, inherent Power to mount up as on eagle wings and to overcome. Yet, the inscriptions of the past and the sense of far-off worlds, of future activity, blend admirably with the strands of men's present weavings and the integration of Cosmic Desire into their consciousness. 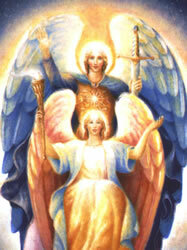 "The ingredient of spiritual longing, passed through many hands of Light, embodied upon the terrestial globe you call Earth, will make light work of the task at hand, the appointed destiny of mankind to overturn the lords of war, to overturn the bonds of prejudice and entrenched mortal authority — by recreating within the framework of the existing world authority newness of life and changes of right — to shatter the matrices that have outlived their usefulness, and that bind men and women to paths of continuing frustration and terror. "Think ye not that men of little faith in ancient Babylonian civilizations, dwelling in the beauty and splendor of the hanging gardens, and men and women of ancient Egypt seeing the grandeur of the Ptolemy dynasty and the mighty glory of ancient Egypt did not also witness miracles of nature and stand puzzled concerning the origin of life. The injunction 'Behold, ye despisers, and wonder, and perish: for I work a work in your days, a work which ye shall in no wise believe, though a man declare it unto you' applies more to the present day than even to the past. "Although the knowledge of man has broadened, his spiritual understanding is very narrow to the present hour. 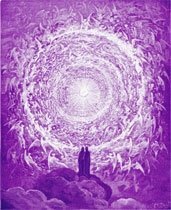 While the Ascended Masters and your own beloved Saint Germain continue to serve with beloved Jesus and the mighty Hierarchy of Life, it is a fact that the planet is overrun with lifestreams who selfishly pursue their own ends. Knowing the imminence of death and destruction all around them, and understanding some measure of nature's Power, they are still unwilling to depart from the realm of the 'normal' and the mass intelligence that seeks to conquer the universe. They are unwilling even to attempt to understand the mighty miracle Presence of Life that is within them and the need to harness cooperatively the God-Power as a means of unification and brotherhood. 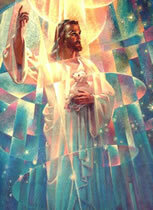 "The message of the Resurrection of the living Christ is a radiant one for all to pursue. It is the culmination of a faith spanning the centuries of the grandeur of a noble heart that of old said, 'I will lift up mine eyes to the hills, from whence cometh my help. My help cometh from the Lord, which made heaven and earth.' . . . ."